Blue Cheese, Fig, and Pancetta Crostini - Home. Made. Interest. 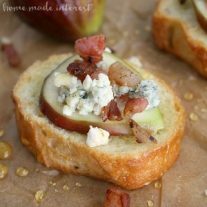 This Blue Cheese, Fig, and Pancetta Crostini is an easy appetizer recipe with the sharp taste of blue cheese combined with fresh fig and the salty pancetta layered on a toasted baguette. I don’t make it out to the movies nearly often enough. I usually see a movie trailer and swear up and down that I’m going to go to it and then before I know it the movie has come and gone from theaters and I wind up renting it and watching it at home. When I saw the trailer for the movie Burnt I swore I was really going to make it to the theater to see it when it was released. This movie has it all, cooking, drama, and Bradly Cooper! I’m going to be honest I probably would have seen it even if it only had Bradley Cooper, BUT a movie about a Michelin star chef definitely peaked my interest. Burnt released on October 30th and Melinda, a friend, and I went to see it on Sunday. I really liked it. The food was so gorgeous (so was Bradley), we left feeling inspired to make some recipes inspired by the movie Burnt. Something a little fancy and outside of our norm. Since it was a girls’ afternoon we went back to Melinda’s house, opened a bottle of wine and got to work. 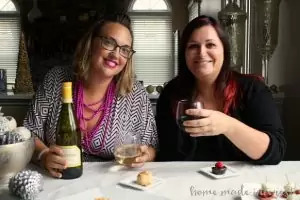 Now, the first thing I think of when I think of food to pair with wine is cheese, and second is small, bite-sized appetizers…though that may be because Melinda and I are obsessed with bite-size food. 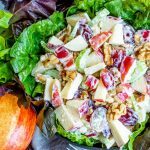 Melinda’s mom had just dropped off a bag of fresh figs from their fig tree the day before, and Melinda had a couple of flavors of Castello® cheeses in her refrigerator. 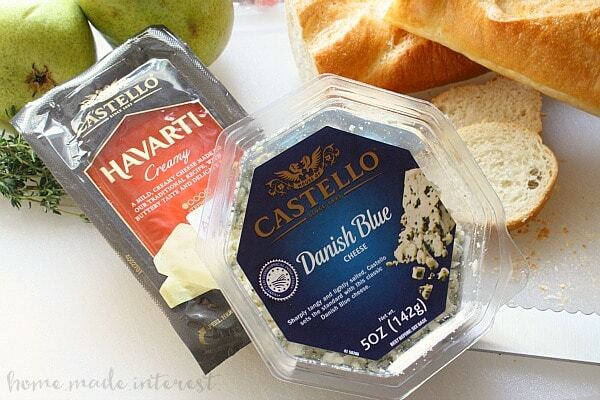 Castello has been making cheeses since 1893. They have three varieties, Havarti cheeses, Blue cheeses and Crème cheeses. All of them are made with natural ingredients and attention to detail. Havarti cheese is known for its subtle yellow color and very small irregular openings, and has a mild, buttery taste and smooth, creamy texture. It is great sliced, grilled, or melted. 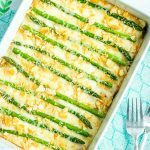 We used it recently in our Bacon Artichoke dip and it was so good! This time we decided to pair the blue cheese with the fresh figs, along with a little crisp pancetta, and a drizzle of honey. We toasted up some thin sliced of french baguette to make crostini, and layered everything on the bread for one delicious bite. It turned out to be a really easy appetizer recipe but it looks so fancy! 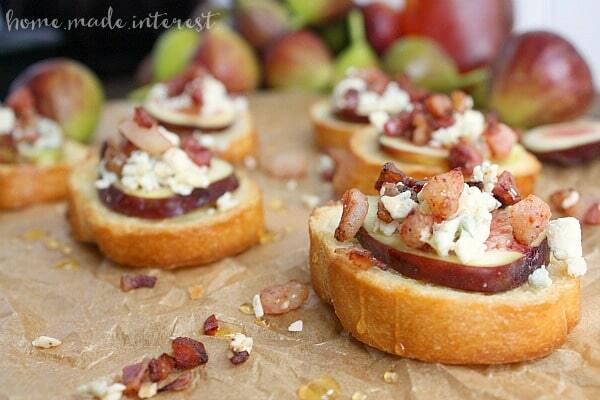 Slice fig and place on top of crostini. 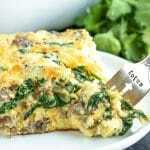 Layer with blue cheese & pancetta. Now through November 20th Castello is hosting an Unlock Your Inner Chef Sweepstakes on the Castello USA Facebook page . You’ll have the chance to win delicious prizes, including private cooking classes for two and a year’s supply of Castello cheese! I gotta go see that movie. And I gotta make these crostini. 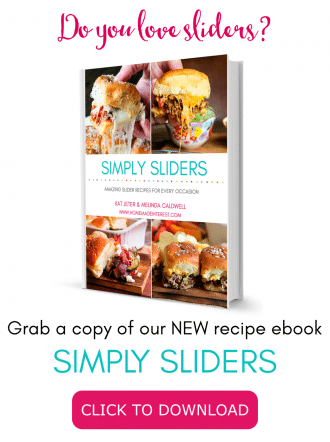 These look absolutely delish!! Found you linked up at Homestories A to Z! 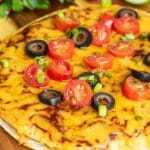 This looks like such a delicious appetizer option- awesome flavor combo! This is a perfect appetizer. I’ve had figs on my mind for a while. Guess this is a sign that I should add them to my grocery list this week.